These link leads are designed for use with our range of KnightsBridge T5 Link Light Fittings, and can be used to link up to 6 lights in series. 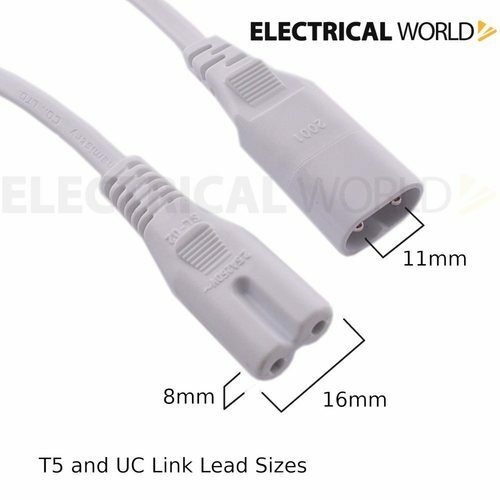 Ideal for linking your T5 fittings along walls or even around corners, these T5 link light leads are available in a range of lengths to enable you to create your perfect lighting solution. Note: These link leads are designed for use with our range of KnightsBridge T5 Link Light Fittings and may not be compatible with T5 fittings from other manufacturers. Product is actually 42" long versus 36" and works great! What started as a simple LED workshop lighting installation using 48 inch LED fixtures purchased on Amazon turned into a nightmare when I couldn't find the right size connection leads to string them together. After searching everywhere in the USA I found these in the UK. Great service, shipping and product.